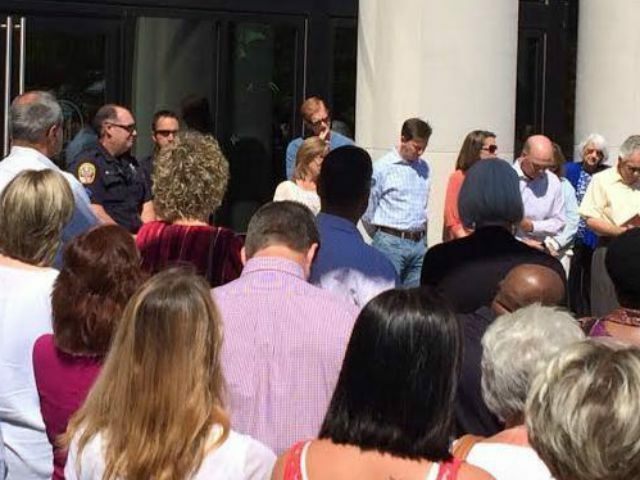 FRANKLIN, Tennessee–The congregation of the Fourth Avenue Church of Christ closed its worship service by praying over the Franklin, Tennessee Police Department. Some 350 church goers made their way three blocks from the church building to the front steps of police headquarters on Columbia Avenue, where they were met by the chief of police and several on duty officers, who warmly received them. Senior Pastor Patrick Mead explains why the church thinks it is important to pray for local police officers, two days after the fourteenth anniversary of the 9-11 terrorist attacks. “I’ve met with dozens of police officers and federal agents in the last two months and heard from them how they have felt a increasing sense of danger and a loss of support from the community,” Mead tells Breitbart News. “Much of this has been due to the #blacklivesmatter movement but it has also been the result of several negative reports from mainstream media sources where the police have been portrayed negatively. At my congregation, Fourth Avenue Church of Christ, we have a dedicated Prayer Team that meets several times a week to pray for specific people and needs. I thought it would be a good gesture of support — and reveal our hearts — if we prayed in front of our local police headquarters,” Mead explains. “I floated the idea to several on the team and they enthusiastically agreed to set it up,” Mead says. But the prayer session at the police headquarters was not entirely a surprise to the Franklin Police Department. Mead describes for Breitbart News what took place during the prayer session. “We sang a song, spent some time reading scriptures and praying, and then delivered a large bundle of thank you letters and letters of support written by our children and teens,” Mead explains. Franklin, a city just south of Nashville, Tennessee, has a population of 68,000 and employs more than 250 police officers and firefighters. The prayer session on Sunday in Franklin is just the most recent example of public expressions of support for law enforcement officers. On September 7, an elderly Arvada, Colorado, woman visited her local police station, found an officer, and hugged him. The woman was reportedly upset over all the violence she’s seen toward officers lately, and she simply wanted to give an officer a hug. “It’s nice to be on the positive side of things. Sometimes you need to put something in the bank on that side after all we see on a daily basis,” Officer Chris Steiner, the recipient of the hug, said later. Breitbart News asked Mead if he thinks other churches will follow the example of Franklin’s Fourth Avenue Church of Christ and publicly pray for and over law enforcement officials. “I posted a nine second video of our gathering on my Facebook page and within hours it garnered 500 ‘likes’ and 23 comments from churches ready to copy our walk in their own communities. I also posted it on our Twitter feed and other churches picked it up, retweeted it, and pledged to do the same in their towns,” Mead says. But Mead and the Fourth of Avenue Church of Christ are not stopping there. “We plan to follow up with a similar walk to our sheriff’s department, letters of support sent to all local law enforcement agencies, and a special service at our building in support of first responders,” Mead adds. Mead spent two days last week on Mackinac Island with the Michigan Chapter of the FBI National Academy Association (FBINAA) giving keynote talks on fear, response, and leadership. He has been a part of the Michigan State Police, Homeland Security, and FBINAA summits on leadership training for the last 8 years.